Your opinion on education matters. Day after day, I hear countless adults complain about the plight of our children. I hear how our kids need to “get their act together”, how spoiled they are, and how they are missing the point of what they are supposed to be doing in school and in life in general. In the midst of this, I see parents absorbed in their cell phones. Their kids and teens in the car absorbed in their own screens and media to the point where they might not respond if you call their name – mesmerized by some form of media… I hea r parents talk about their own goals and ambitions, yet when you ask their teen about their goals and ambitions, The child has no idea what they want from life. Looking at the landscape of raising our youth, I get distressed about where our future generations are going. Are we doing all we really can to secure our future? We want the plight of our future generations to overcome and succeed further than our past generations, yet most adults who are concerned about this issue are not concerned with giving back to our youth. The wealth of knowledge, experience, and hardships we have been through serves a purpose to be shared with those that come after us, so they don’t make the same mistakes we’ve made. Kids learn from us, so by learning from our mistakes, they become better. Teens get so much more from seeing and speaking to us in person than they can get from a screen. We know and understand this, yet so many adults are still disconnected from having a real influence to the future of our world. We have become a people so self-absorbed in our own lives, we casually forget about the lives that will be ushering us into the future. We are so busy working on growing our brand, getting the promotion, and raising our own personal stock, we will tell others that we advocate for children, but really do nothing to pour into them directly. For example, to get a group of adult s besides teachers to come into the schools regularly to mentor children is extremely difficult. This is partially due to the red tape schools have created, which is a whole other issue, but parents also don’t have the time due to exorbitant work schedules and meetings. Many adults have told me they just don’t have the patience to deal with their own child let alone another’s. “Dealing” with kids has become low on the totem pole to many adults in our society because it is not considered a priority. It is as if when others find out that someone has dedicated their life to “raising kids” it’s considered a novel and cute idea, but not practical. I don’t see many other options to secure a better future, but so many adults are concerned with their own pride and ambitions they don’t see the relevance of directly helping the youth in their immediate, day-to-day experiences. Where is the need to do for others? Serving that need would in turn be a way to help ourselves, but since there is no instant gratification, it is often overlooked. We are caught under the same spell as our kids, but we don’t see it. We stay self-centered in our own media & ambition driven world, so our kids are the same. This will not do for future generations if we are to raise our kids to become more community minded. To put this in perspective, just imagine if the generation before us did all they could to invest in us. What if they spent the majority of their time making sure that every figurative crack we could fall into was covered? What if we were geared to change the ills we saw in society, not just speak out about them? What if we were taught to become the policy makers, doctors, teachers, business people, and creators of a future that would change the status quo for the better? Of course we would still have problems, but there be more forces to fight against the injustices that we see. We would be more ready to provide for ourselves and less dependent on a society that may not always be ready to act on our best interest… If the generation before us passed the torch of the need for change and made it a priority, we’d be closer to our goal of improving our lot in society. We should be training our next leaders; not passively letting a system that most think is flawed have their way with our children. Our kids may have no vision – so I’ve heard – but that fault is purely ours because we know what they are up against, yet so many of us sit back and let it happen. The need for decent, strong teachers to guide the youth into the future is tremendous (repeat that if needed). These kids need to see positive, diligent role models that have a continued, daily investment in them, not just some politician or public figure using their plight as a publicity stunt to further their careers. We will never overcome our obstacles as a nation if we don’t teach the future generations how to overcome these obstacles together. I tell my students regularly, “I teach because I refuse to leave my own kids behind in this world with a bunch of knuckleheads. I need y’all to do better.” If we spent most of our time getting these kids ready to take over the world we are leaving behind to them, we’ve done our job in this generation, and we’ve made the best investment for our own kids in the future. So, who’s ready to take up the torch? Though many educators won’t admit this is happening, studies are showing that the disciplining of certain ethnic backgrounds are extremely disproportionate from others. I have seen first-hand where teachers, regardless of their own race, have come down much harder on students due to gender, race, or some kind of favoritism. Still, why are the numbers so skewed against African-American children? Plus, is it happening as early as preschool? What kind of teacher can’t handle a kid from preschool, so they suspend them? EBO and others are fighting this fight everyday… We must protect our children, regardless of their background. After a little over four years of operating EBO, after almost eleven years of being an educator in and out of the classroom, after talking to teachers, parents, and students alike and different in many ways, and after helping many students, parents, and educators reach their educational goals, I feel safe saying what many in the educational field avoid saying: Education in America is in drastic need of reform. Whether it be private or public, there is an overwhelming, growing dissatisfaction in how students are learning and competing in the academic realm. Many highly-degreed educators have written and spoken about various solutions: The schools need more money, the schools need better technology, the schools need better teachers… All of these solutions have made a few improvements, but are mere band-aids to a bigger problem. Far too many school systems have pumped money into their schools to no avail — just more expensive failure rates. Tablets and smart boards in the classroom mean nothing when a teacher can’t teach well. Hiring better teachers does work (better teachers, not necessarily younger), but the immediate damage is overwhelming because the teachers who have invested so much time and gained so much experience in their craft are often thrown to the wayside for the sake of getting new, inexperienced teachers which keep the pass rates in a constant flux. Standardized test scores are dropping, students are becoming increasingly disengaged, and sadly enough, teachers are becoming disenchanted with their jobs. What has happened? What seems to be the problem? Or, the better question is, what is the answer? The answers don’t lie so much in the material and how it is being instructed as they do in the parties involved. Namely, the answers lie in the students, the educators, and the parents. The way we are all engaged in the process of education has changed drastically, and it is the afore mentioned’s attitudes towards education that have been the issue. We can come up with a million different instructional methods, create as many “new maths” (a term I still find funny) as we want, but it will not change the intellect of our students until we change the cultural attitude of education as a whole. We live in a society that places entertainment, money, and sports above education on all fronts. And God has been taken out of our schools. No wonder we are having problems. Parents need to actually become a part of the educational process. – Yes, we have heard this one a million times, but how many times must one hear something before it is actually done? I have known too many parents who complain about their child’s performance, yet they don’t show up to conferences, they invest no time at home in their child’s learning (but their child always has the latest Xbox game), and they make sure their child makes every sports game, but step foot in their child’s classroom maybe twice a year. 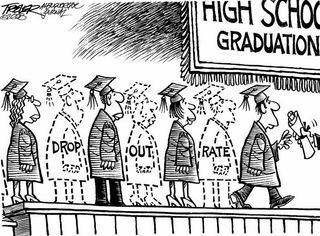 Sorry to gripe, but just because you pay $1000 a month in tuition, doesn’t mean your child will get the best education or do well in school. It takes an active parent that reinforces what is happening in the school at home. It takes a parent that is in constant contact with (even to the point of harassing) their child’s teachers and administrators to safe guard their child’s best interests. Finally, it takes a parent that is not trying to be their child’s friend, one that will not let their child play them against their teacher (and vice versa), and one that will hold their child accountable (and discipline them accordingly) for their own child’s shortcomings. We need to teach students how to be students. – We spend thousands of dollars every year in new ways to teach students math, science, and social studies, yet we are missing the mark. We should be spending the most money on something that will improve all subjects across the board: Student Skills. Study skills, note taking, organizing, and prioritizing information, listening and communication, these are all skills that students are expected to know and do well, but don’t. These subjects are not taught in school, the one place where students would benefit from them the most. Teach students how to be students first, and the performance will follow. We need real educators to stand up. – We need real educators that are obsessed with the improvement of children and their parents, not their occupations or a paycheck. Yes obsessed… I have actually had teachers who have called me or my wife with their numbers blocked and refused to email because they did not want us, or any other parent, to reach them unless they allowed it. Meanwhile, our child suffered. We were kept in the dark about everything, and the only reason we made any kind of headway with the teacher was because we went up there at least once every other week to harass her. Oftentimes, we were met with an attitude. It seems like the teacher just gave up on our child, and overall, gave up on us. This type of behavior is not being a real educator that realizes that a healthy communication relationship with a parent and a student makes all the difference. Teachers, if you are hiding from (or have an attitude with) your parents, I invite you to think about changing your profession, because you are missing the point. You are a servant of the the very people you are having an issue with. We need better communication. – When I taught middle school, I had an email and phone number list for all my students. I sent home all my assignments, projects, permission slips, and progress reports via email. It took nothing for me to send a short group email once a week with attachments of created or scanned papers. Parents who checked their emails were pleased because they stayed informed. They knew about assignments and expectations before their child did, so they were able to hold their child accountable. Forms weren’t lost due to lack of responsibility. Email also doubled as a way for me to address behavior issues and classroom concerns either from me or from parents. It made my job easier as a teacher because parents didn’t have to come after me, and when they did, I had a dated paper trail to cover me. Plus, once the kids realized nothing was able to slip through the cracks, they had to straighten up too. These observations are just the start of what needs to be done to change the educating of our future society for the better, and I will be expounding on these issues again at a later date. Until changes are made in these areas, academic performance won’t be improved. We can’t keep throwing money at a problem when funds are fundamentally not the problem. Putting lipstick on a pig, buying it an expensive dress, and giving it a smart phone will not make a pig conduct business better… We need to see improvement in the areas mentioned above, or nothing about education will change much. Except of course, bringing God back into the schools… but that is another matter altogether. If you agree or disagree, please give a comment below. Your feedback is always appreciated and learned from. Happy Thanksgiving from @ebotutoring and @kreneephotos!